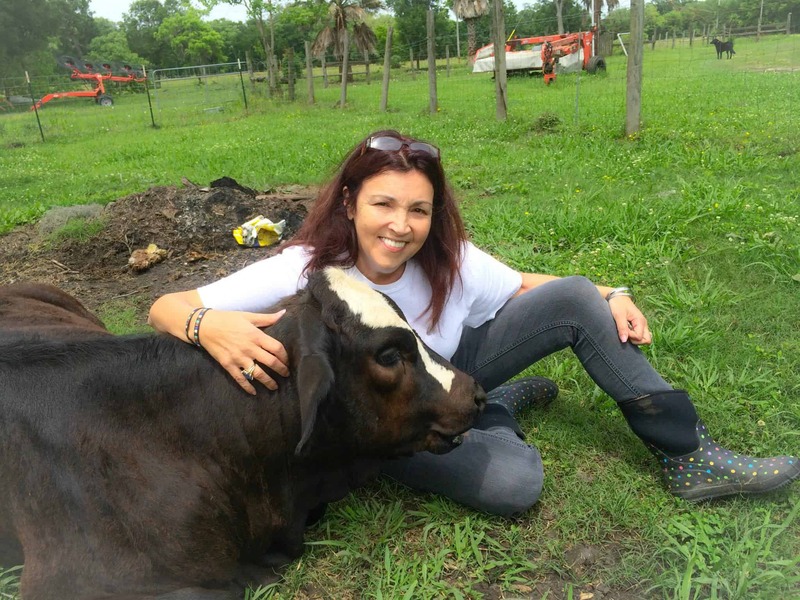 In the same vein, my guest Renee King-Sonnen, who married a multi-generational cattle farmer in Texas, has the unique ability to reach other people who work in the heart of animal agriculture and show them there is another way, that they don’t have to make their income from the suffering and death of other beings. One of the objections to a vegan world is that farmers will be out of work. Well, Renee is blazing the path to an alternative. I’m so excited for you to meet this one-woman revolution. “I remember the red trailer being out in the field. And just was like, so stark against the green grass, and the cows, and the babies, it was there. It was there for several days because you had to bait the babies to go in. They didn’t want to go in except that they were baited, and there was a chain on it so that the babies could get through, but the big ones couldn’t. “And Houdini [one of the calves] had been getting out every single day, if you heard anything about this story, you know that Houdini was getting out along the highway, and so my husband was adamant about Houdini was going to have to get out of here. She was a liability and there was no way [I was going to sell her] because that was Rowdy Girl’s baby. And so I looked all over Texas for a home [for her]. … [B]ut there was no one that would take these cows…no one. “Because his heritage was so deep it was really hard for him to make the connection, especially about the deer heads being on the wall because they were just mementos. He would use this terminology with me and I showed him your hunter one. I hope you enjoyed hearing Renee’s incredible story of conversion. I think her husband may win the most unlikely vegan of all time award. There’s so much more that I didn’t have time to include in this video, like the fact that they are starting a veganic farm on their property, meaning growing their own food and food for their community without using any animal manure, bone meal, or anything from animals. As I said in the beginning, Renee is creating a model for other farmers to follow–the end of animal agriculture is the beginning of sustainable veganic agriculture and there is still plenty of work for farmers. Renee has the support of such heavy-hitters as Kip Anderson, the creator of Cowspiracy, and Howard Lyman, a former cattle rancher himself turned vegan animal advocate, and her mission is growing by the day. You can check out all her links below to get in touch. Now I’d love to hear your thoughts on this incredible story. Does this make you rethink the possibility of who can be vegan? Are you an unlikely vegan or vegan-to-be? Let me know in the comments. Deer Overpopulation: Solution or cause? Renee King-Sonnen is wonderful. Meat eating people need to hear from people like Renee as to exactly how the animals are slaughtered. They close their minds and just buy it in the market. P.S. You are not a ridiculously tattooed girl, you are a compassionate person who is educating more and more people to the benefits of being vegan and the lives they will save. Such a lovely story, I was crying and laughing. It also gives me hope that anyone can go vegan. What a great interview. Like Renée, I have just never made “the connection” between many things having to do with animal consumption, etc. I still have a long way to go. As someone who is new to all this and not yet a vegan, I would like to commend you on your tolerant, gracious approach to those of us who still eat meat and are “dipping our toe” into this whole thing. You are graciously informative, rather than mean or condemning. That goes a long way. Thank you so much. I look forward to learning more and exploring your website. This gives me so much hope. I live in Big Cattle Country and would love to see cattle ranching replaced with wind and sun farms but worry that the mentality that is entrenched here is what prevents it. I know these ranchers are, at their hearts, good people, and they need to make a living, hence my wish that they could use their land, but for renewable energy, not killing animals. Renee and her husband’s transformation is truly miraculous.